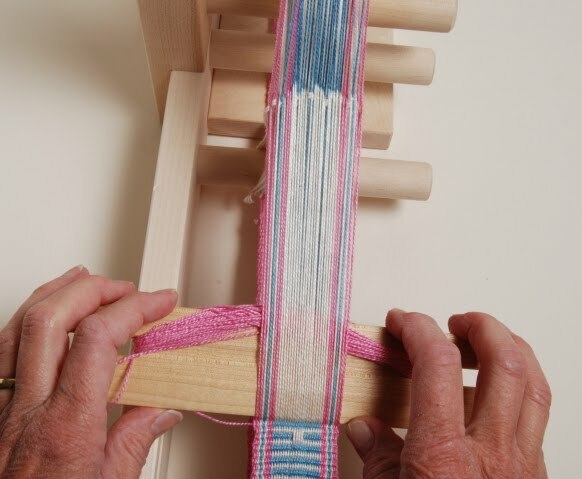 Weaving a pick-up pattern on a Schacht Inkle Loom. 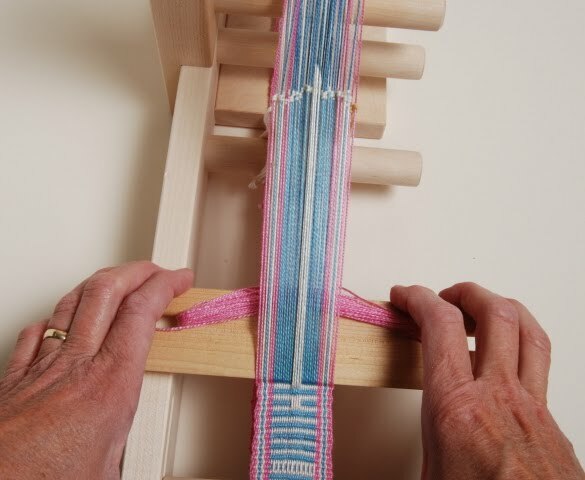 There are several ways to do pick-up on the Schacht inkle loom. 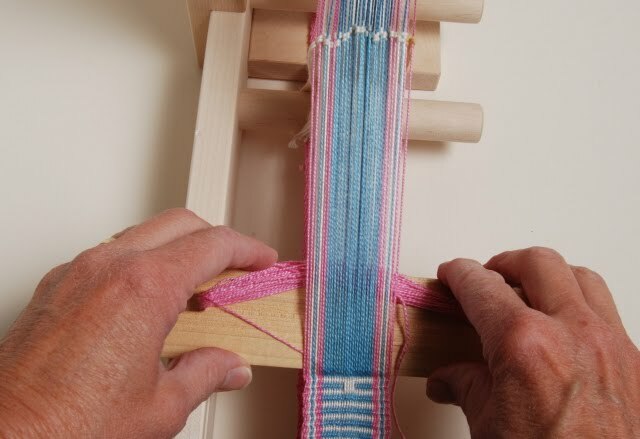 This warp-wise pick-up technique is super easy to do and is a great way to begin exploring pick-up patterns on the inkle loom.I find that it’s easy to see what’s going on if I warp up my loom with the pick-up-area warp threads in two contrasting colors, one color for all of the heddle threads and another for the non-heddle, or open, threads. Here I’ve alternated blue and white threads, with the white threads held by the heddles. 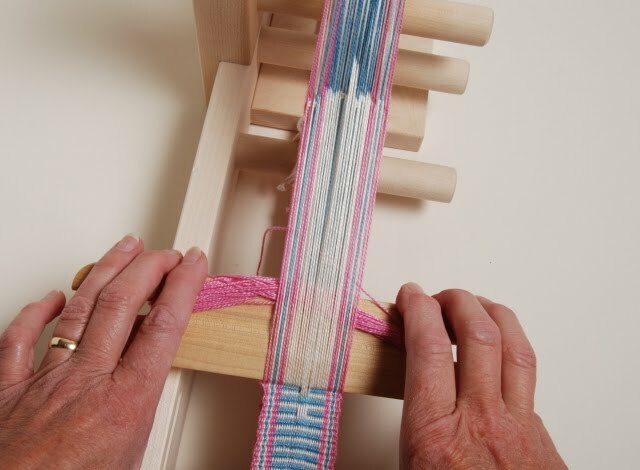 You will pick-up the open warp threads, white in this example. Hint: to remember which ones you pick up, keep in mind that it is the threads that are not contained in heddles that are easy to move. Step 1: Push the open (non-heddle threads) warp threads down, blue (threads in heddles) will be up. Weave across. Step 2: Push the open threads up, white will be up. Weave across. 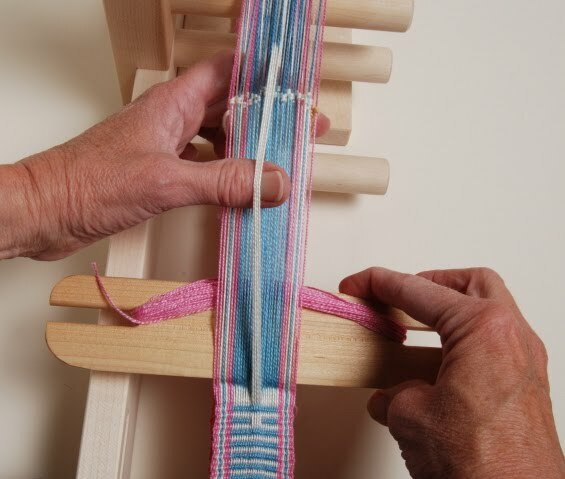 Step 3: With the shed still open (white threads up), pick up the desired warp threads (white, non-heddle threads) and place them on your finger. Step 4: Still holding the threads up, change the shed, (pushing down the white threads). Blue threads, plus the white picked-up threads will be up. Weave across. Step 5: Change sheds, so that the white threads are up and weave across. Step 6: Repeat 1-5 as desired. Here I used 5 warp threads for my pattern, next time I could repeat this or lift other threads. I sometimes plot out my pattern on graph paper, with one square representing each warp thread.P.S. My apologies to the patient person waiting for this post…I hope you will find it helpful–and worth the wait!